Black actress Noma Dumezweni has been cast as Hermione Granger in the upcoming production of Harry Potter and the Cursed Child, a move celebrated by fans who have long explored the concept of a black Hermione. The announcement reignited a long-running debate about Hermione's race with many pointing out that the character's skin colour is never specified by author JK Rowling. In the books, she is described more often by her personality traits than her physical appearance. She's clever and loyal and a valued friend. Many people associate Hermione with Emma Watson who played her in the films. But some argue that it makes sense for Hermione to be black because of the challenges she goes through. The character fights a constant battle against prejudice because she was born to non-wizarding parents. This casts her as an outsider in a world where wizards of "pure" blood are seen by some to be superior, and "mudbloods" like Hermione are looked down upon. Online, Art by Harry Potter fans depicting Hermione as black or non-white has been circulating on sites like Tumblr for a while. Representations of other well known characters in film and literature as a race they are not typically associated with are also popular. It's known as "racebending". 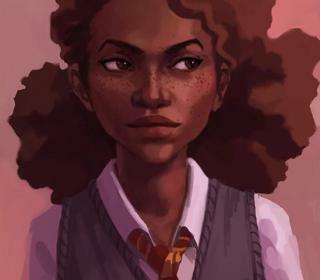 Marianne Khalil is one artist who decided to draw Hermione as black. She says she originally did it as a gift for a friend but "because Hermione is never explicitly stated to be white in the text, there's an opportunity to create representation where there wasn't previously." "It's important that Hermione can be read as a woman of colour, and all of these artworks depicting her as such are reclaiming that for the people who lost representation to the films." Writer Chantell Monique describes herself as a dedicated enthusiast of Harry Potter. She says it wasn't a surprise to see Hermione cast as a black actress. "I was just like 'of course she'd be black'." But she says challenging the norm is important. "Seeing the actress for me is like coming home. There's a comfort to it that I didn't even realise." "I've always connected to Hermione but having her look like me, or my mother, or my aunt is amazing." Cousins Robyn Jordan and Bayana Davis run a website called Black Girls Nerd Out. It centres on identity in fan culture and explores how identity is portrayed. They say this announcement is definitely something to be celebrated. They've both been Harry Potter fans since they were children. While they both could, and did, identify with Hermione, they always saw her as white. Bayana says it's great now to literally be able to see herself in the character. "So much media out there that reinforces the idea that white people can be anything and do anything and we don't get that as much for black characters and black people." Robyn added "Moving away from the fact that a character default is white is important. Representation in general is a big deal." Ebony Elizabeth Thomas is an assistant professor specializing in children's literature at the University of Pennsylvania. In the past, she has written some of her own Potter fan fiction. She says she cried when she saw the casting. For her, this is revolutionary. "What this signals is that race doesn't necessarily have to be the defining characteristic of a human being. What is essential about Hermione is not her skin tone, what's essential about her is that she's smart." Thomas says she's noticing a definite shift towards what she calls colour blind casting. The Broadway musical Hamilton, based on the life of founding father Alexander Hamilton, is a great example, says Thomas. Actor Lin-Manuel Miranda currently plays the lead role. He is of Puerto Rican descent. Thomas says depicting one of America's founding fathers as anything other than white would have been difficult until recently. "In a world where Alexander Hamilton can be Puerto Rican then why can't Hermione be black?"